The ATM advantage. Why Our Glass Enclosure? 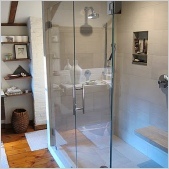 Design starts with a senior level consultant who will devote time to listen to your thoughts and help design an exceptional shower enclosure. All glass is measured for accuracy, designed to fit into the space it has been measured for. 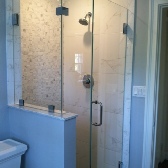 Enclosures are engineered at our facility, using software especially designed for the shower door industry. 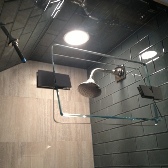 All of our shower enclosure engineering staff has received extensive training in developing an enclosure that meets and exceeds safety standards. We use only heavy duty rated hardware. We do not cut corners using lighter duty hardware that meets minimum requirements for weight ratings. All hardware is brass construction. We are the manufacturer. We are not subjected to a 3rd party’s idea of “acceptability” such as “acceptable flaws”. We are able to quality control all products before they are released as “good” for installation. We are also able to accommodate complex design elements as the manufacturer, offering the client a truly custom product. In addition, we can turn around your enclosure in as early as 3 days if needed.  In the event a problem should arise, we are able to quickly resolve. All glass is cut on a CNC cutting table- meaning our glass is cut by a computer. Glass is cut with a higher level of accuracy and much faster than what could ever be done by hand. So if you need one enclosure or one hundred enclosures, we can do this quickly with incredible accuracy.- Even with complex designs! 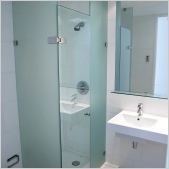 Frameless enclosures come STANDARD with protective glass coating to help keep your glass looking as clean as when first installed. 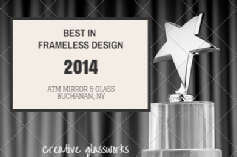 ATM Mirror and Glass is a nationally recognized leader in the design, fabrication and installation of frameless shower enclosures. We have made a commitment to our clients in both product and performance. Our enclosures all feature fully frameless styling and are fabricated from start to finish at our state-of-the-art fabrication plant in Westchester County, NY. 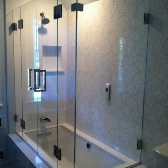 We have had frameless enclosures featured in Dwell Magazine, New York Times, Westchester Home, and USGlass to name a few. At first meeting with one of our consultants for your frameless enclosure, you will know right away you are dealing with a professional. We take the time to get to know what you are looking for with design, understand purpose and develop functionality and convenience. 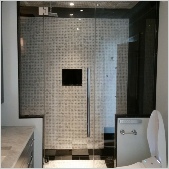 Our design consultants for glass enclosures have many years practical experience in both designing and installation and are happy to assist with any questions that you may have. "All Glass Fabrication Performed At Our Facility For Faster Lead Times, Greater Quality Control & More Competitive Price Point"
insulated glass Glass Railings & Guard Rails Glass Railing Gallery Storefront Systems Curtain Wall mall fronts All Glass Entrances & partitions Over Head Glazing And Skylite Systems Glass Flooring & Stairs residential fronts Windows and Doors Special Services!